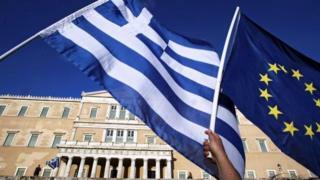 Eurozone countries have agreed a long-awaited debt relief deal for Greece, which has been hailed as "historic". The deal gives Athens more time to repay â¬96.9bn (Â£85bn) worth of loans and extends a grace period during which Greece will pay little or no interest. Greek Finance Min ister Euclid Tsakalotos said it sent a signal that Greece was turning a new page. EU Economic Affairs Commissioner Pierre Moscovici said the agreement meant "the Greek crisis ends here". Under the deal, eurozone governments are also giving Greece a final cash loan of â¬15bn to help it keep paying its bills. Greece's current bailout programme is due to end in August. In return for the bailouts, Greece has had to enact a series of tough economic reforms. In the immediate aftermath of the crisis, the country's economy shrank and unemployment surged. Greece' s economy has since stabilised, but it still faces the problem of making payments on its accumulated debt pile, which stands at about 180% of GDP. But speaking after the latest debt relief deal was agreed, Mr Tsakalotos said he thought it was "the end of the Greek crisis". "I think Greece is turning a page," he said. "I think that it has all the building blocks there to leave the programme with confidence that we can access the markets, that we can implement our growth strategy and turn the agenda away from one of fiscal adjustment, which has been completed, to one of growth. "So I think it is a historic moment as people have said, a momentous moment." EU commissioner Pierre Moscovici said: "The Greek crisis ends here tonight. "We finally got to the end of this path which was so long and difficult, it is a historic moment." "In the medium-term analysis, there is no doubt in our minds that Greece will be able to reaccess the markets," said IMF managing director Christine Lagarde. "As far as the longer term is concerned, we have concerns," she added. Twin polls will decide if President Erdogan wins a second term, and who sits in Turkey's parliament. Can the EU reach a new deal on migrants?